It’s late November 1899 and with Victorian England engulfed in waves of pre-Millennial fear and expectation, a book entitled Tales of Space and Time is published in London. This is a collection of short stories by H. G. Wells, an author whose earlier works The Time Machine and The War of the Worlds have laid the foundation stones (time travel, alien invasion, etc) for all science fiction to come. This new compendium includes stories that cross the gamut of time, from the Stone Age era to a far distant ecological armageddon. Exactly sixty-four… a perfect cube, perfect square… years later, on the 22nd November 1963, on a road skirting a city park in Dallas Texas the 35th President of the United States of America, John Fitzgerald Kennedy, is assassinated [or has his death faked] by one [or more] individuals [or government agencies, foreign powers, criminal organisations]. This event will give birth to the conspiracy theory industry. The very next day, a British television serial largely inspired by the writings of H. G. Wells airs for the first time. Things get off to the worst possible start for Brighton. Whilst we were somewhat surprised and pleased to see they had rostered nearly a full squad of fourteen for this bout – a rare state of affairs for the Sussex league – once the skate out commences we realise we can only count eleven Brighton skaters on track. There’s also a ferocious looking bright blue dinosaur bringing up the rear. 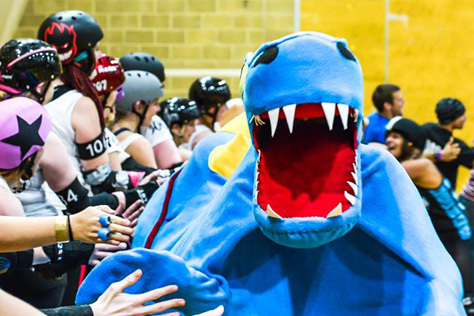 A quick check of the team list and visible skaters suggests the creature has already eaten Emma the Condemner and Chariot Sophia, and now has its carnivorous eyes on the remaining Brighton players. This dancing procession seem aware of the impending threat, but have chosen to respond to it by pulling studied arm shapes and horrified expressions as they skate slowly around. Whilst this sort of behaviour might look good in a pop video, it’s totally not appropriate WHEN YOU ARE BEING CHASED DOWN BY A 200 MILLION YEAR OLD PREDATOR WHO HAS ALREADY CONSUMED 15% OF YOUR SQUAD. “Speed up, gadnammit,” my assistant screams at the Rockers. He starts panickedly rummaging in his rucksack for something to distract the beast with. “What do dinosaurs eat?” he asks me. Brighton skaters by the look of it, but all he possesses is a couple of bags of Haribo Rainbow Stripes, and he seems more keen on eating these himself than using them to rescue the team. Momentarily distracted by his rucksack frenzy, by the time we look up the skate out is over. Somehow the Rockers have extricated their two skaters from the creature’s stomach. The duo now line up alongside their team mates and the carcass of the beast – split apart from neck to tail, presumably as part of the rescue – lies discarded to one side like some hunter’s trophy. THE SCORE SO FAR: Brighton Rockers 1 – Rampaging Primeval Beast 0. 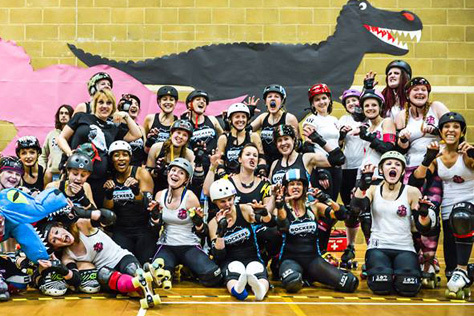 There are other beasts to be met on the track now though, in the form of the Central City Rollergirls, a long established and well feared derby league from Birmingham that Brighton surprisingly never met in May’s London tattoo show tournament. The Centrinnians boast some formidable skaters. Their jammer rotation includes England’s 2011 World Cup international Hustle’Her and Viv La France from Jenesaispasoù. There’s also diminutive but deadly Tinchy Slider, who could slip through a gap in a pack of cards let alone a pack of blockers, along with Dr InKnockulator who no derby announcer in the country can mention without immediately adding “who is actually a real doctor.” This rotation goes to work on the Brighton pack quick and fast. Rose Bleed actually breaks through first for Brighton in the opener, but a track cut on the way sees Tinchy pick up a CCR power jam, although rock[ers] solid defence keeps this down to a single pass 0-5. Still, it took Brighton thirteen jams to get their first penalty call last home bout (and even longer for the first jammer one) so this is an instant return to the penalty heavy play that has blighted them across much of this year. The Mighty Mighty Bash pulls it back to 4-5 in the third but is sent off herself, with pivot Chariot Sophia (possibly still recovering from her time in a dinosaur’s intestines) soon joining her in the sin bin. Ouch. Viv La France puts up a solid twenty in the fourth as the Centrinnians start pulling away. CCR are well known for their small in number but very clean jamming rotation, and that certainly seems to be the case here. In fact, not only are their starheads not picking up any visits to the box themselves, they also seem to be pretending that the jammer box doesn’t exist in general – we rarely see them calling a jam off when their opposite number is standing in the box. This reluctance to take those ten seconds’ jammer advantage at the start of the next jam – let alone prevent the bigger Brighton rotation putting a new starhead into play – may come back to bite the Midlands outfit like an angry T-Rex later on. But not right now. Certainly not. It’s so very easy to focus on jammers, but of course there’s another reason that CCR are stretching the differential out to dinosaur-sized gaps now (4-25, 4-45, 4-63) in spite of Brighton’s resilience. That reason is a blocking line-up for whom Bunny Massacre and Woo-Ha are the most easily identifiable; they are, let’s not forget, bracketed alongside the Great Wall of China and Belgian Motorway System as being the only human creations visible from space, largely as they’re halfway up there already. 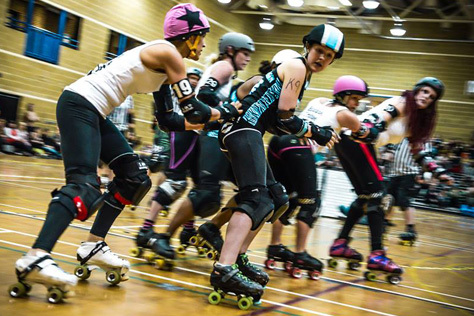 With the likes of Erin Blockhervitch and Boots Manuva adding land support to this air power, the CCR pack are proving as mean as the average value of a set of numbers to the Brighton jammers. Ever feisty Shambolic is picking up multiple penalty box visits for the home team, and the scoreline differential now shows more than 15 CCR points for every one of Brighton’s. [For what it’s worth, seven Rockers points for every six from the Midlanders had been the ranking site’s pre-bout prediction.] The Sussex side look to need a miracle already. Maybe they can resuscitate the dinosaur that chased them in the skate out and get it to eat some of the Centrinnians pack? Thinking about it, Woo-Ha and Bunny would probably end up chasing down and eating the poor dinosaur. I had placed an advert on gumtree, a popular electronic noticeboard, asking if anyone could help provide more information to pad out, I mean complement, my report on a Brighton Rockers roller derby bout. I hardly imagined that a distant relative of H. G. Wells himself would get in touch, yet that’s who my new acquaintance claims to be. He has summoned me here to Woking, a blue-grey stain on the map where the ink of Greater London lands upon the blotting paper of her green belt. I already have reason to suspect that Bertie is not all he claims, particularly when he insists – after ensuring I first purchase him a large mixed grill and five shots of cinnamon whisky – that this public house we are meeting in was once owned by Mr Wells himself. “See, it’s his name above the door,” Bertie insists, as he belches out most of a flat mushroom. I counter that it’s just the name of the pub, and this looks (and smells – by God, the smell) an awful lot like a Wetherspoons. He points out the metal sculpture of Wells in the window that he has been throwing peas at, and also mentions “a statue of one of them bipods from Worlds of War just up the road”, as if these factors might somehow back up his ancestral claims. Whilst Bertie’s credentials may be suspect, and the original Victorian manuscript he claims to possess appears – from the few glimpses he allows me – to be written on Pokémon writing paper, I’m still intrigued when he hints at its contents. “Instead of the Eliohos and Murdochs,” he says, glancing down at what appears to a be a Wikipedia page on his smartphone, “the second book is all about two groups called the Roccas and Sentrinians, and their battles take place on roller skates on, uh, Howard’s Heath. Inside a dolphin.” Now I most certainly am intrigued. I share with Bertie my theories that the bout is somehow linked to Kennedy’s assassination, Doctor Who, dinosaurs and more. He grins, scratches himself in several unpleasant places, and tells me to meet him back here in two hours. He has more documents at home he feels would be of interest to me. I lend him twenty pounds for a taxi and some stationery, and bid him an excited au revoir. Sophia seems to be putting the whole sorry dinosaur dinner thing behind her, racking up a couple of great passes as the Rockers pack hold back Dr InKnockulator, who is actually a real doctor. The 13-63 on the scoreboard suggests there’s a long way to go, but these are Brighton’s first points in five jams so possibly the start of the turnaround? Two England internationals, Bash and Hustle, shoulder up on the jammer line. Bash proves herself Brighton’s driving force with a battling turn in the star as she noushes her way around the track. Drawing penalties from this sterile clean CCR squad is proving tough going, but at least the box is looking a little more grayscale, rather than solidly black tops, now. A power jamming swap over between Rose and Woo-Ha (the latter expertly hit off by Sophia in the process) suddenly sees the Rockers back in it. 50-70. Team time out Central. “If there’s anything you don’t understand, ask someone in an ‘Ask Me’ T-shirt,” the announcers announce. People start queuing up with their questions… Where’s the ball? What happened to the blue dinosaur? Why are the CCR blockers so tall? How could the 2014 beta test WFTDA ruleset possibly deal with passive offence purely on the basis of charging already pressurised individual refs to make instant interpretations re perceived deliberate pack destruction? Did H. G. Wells really write a book of short stories called Tales of Space and Time? Is that an invisible bee in your hair? Where can I buy more Haribo? Brighton taking lead regularly as the game resumes, but CCR jammers are on their shoulders within a single scoring pass. Some awesome England-on-England action as Bash sends a power jamming Hustle flying, buying Sham valuable seconds to get back on track from her latest holiday in the penalty box ‘J’ seat. The next jam sees Sophia score two, her panicked call off before the ever speedy VLF catches the Brighton pack sees her spin into centre track to send ref Noise Tank flying. There are no bonus points for this under the current ruleset. If ever Brighton’s Green-led council want a figurehead for their local campaigns, we suggest they look further afield and call upon Bunny Massacre. After all, the CCR blocker single-bootydly recycles Rose Bleed so many times in Jam 16 that the whole Rockers fanbase starts biodegrading. With Kapow off in the last of this first period’s notably low total (a consequence of CCR rarely calling off during PJs?) of seventeen jams, the Birmingham league sit on the thick side of a 106-65 scoreline. We stagger-saurus, tingly armed and blinking eyed, towards half time libations. Call in the dinosaurs. A monster comeback is needed, but time – that most precious and immutable of resources – is increasingly against the Sussex side. Bertie is almost an hour late, and I’m on the point of paying my bill and vacating the pub when a commotion by the doors signals his entry. He seems a little unsteady on his feet, and is to my surprise accompanied by another figure, who takes occasional swigs from a small paper bag as the duo approach my table. They sit down, at the seventh attempt, although Bertie is sitting on the floor rather than a chair, and his colleague is sitting on a horrified old lady at a completely unrelated table. Bertie introduces his friend as ‘Mad Bob’ and insists I furnish them both with gammon and chips plus several large whiskies. It transpires that Bob is the great-great-grandson of “whoever it was that wrote Jurassic Park“. “Blockabaptas,” shouts Bob. I look puzzled. Sensing that I’m not fully convinced, Bertie prods the meat on his plate. “That’s where gammons are involved from.” I assume he means evolved. “Jammimuses. That’s why they have to put pineapple on it; it’s like garlic is to vampires is pineapple to jammers. Look what happens when you take it off.” Bertie removes the pineapple from Bob’s gammon steak and starts chasing him around the tables with the slice of meat, making shrieking dinosaur noises as he whacks him around the ear with it. Conscious that several people in the pub, including the bar staff, are now looking in our direction, I take the opportunity to visit the lavatory. Half-time ablutions complete, we retake our perches for the second period somewhat apprehensively. OK, the lead isn’t unbridgeable in derby terms. A couple of good power jams would do it. It’s just that Brighton aren’t traditionally renowned for their second half performances. 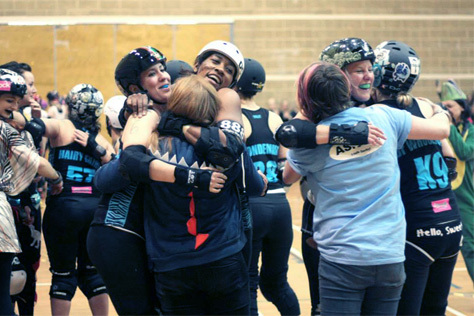 Even during their unbeaten early years, they’d often find big half time leads getting pegged back during the second period, whilst the last home bout, a glorious win over the highly ranked Leeds Roller Dolls, was largely borne of an against-type penalty-free opening twelve jams. [From the point of gaining their first box visit, Brighton actually gave away eleven points for every nine they scored, as per pre-bout predictions, and only prevailed via the 50-point lead they had from those clean opening jams.] We digress, but we have admittedly spent part of half-time preparing things to say if any of the team ask us what we thought of the bout at the after party. “You gave it a good go” is one. “Their jamming is so clean” another. “CCR have such tall physical packs”… “This year was always going to be one of transition for the Rockers”… “We loved the dinosaur”… and so on. Because we’re pretty sure there are only three ways that Brighton, with their second period aversions, could win this one. Either (a) Bash goes extra “ape-sh*t” (as the lady in Whip It describes it) on both the CCR pack and jammers, but she can’t play every jam let alone act as both jammer and blocker in them; or (b) the Rockers suddenly get as penalty box shy as they were in the first 20 mins v Leeds, but the likes of Sham and Sophia already seem so comfortable in the box seats you worry they’ve become institutionalised; or (c) a meteorite like the one that extincted the dinosaurs crashes into this Haywards Heath leisure centre, wiping out all humanity, and there is some obscure WFTDA sub-rule that says in such an instance the bout is awarded to the home team. Personally, we’re banking on (c) because (a) or (b) on their own wouldn’t be enough, and there’s no way BOTH (a) and (b) could happen… is there? Jam 1: Sophia takes lead, 4 point pass, call. Jam 2: Bash takes lead, 4 point pass, call. Jam 3: Rose calls at 3-2. Jam 4: 3 points Bash. Jam 5: Boots Manuva in the star for CCR, takes lead but has to call when Rose overtakes her. Jam 6: Bash up to jam for Brighton… Wait just a minute, something’s going on here… Not only are the Rockers failing to pick up any jammer penalties, but the team with the small jammer rotation (CCR) are adding to it – eg putting blocking hero Boots Manuva in to jam – whereas the team with the larger rotation (BRRD) are just alternating big guns Rose and Bash, the England star and star-in-waiting, now. Suddenly it’s 88-112 and Brighton have closed the gap again. He puts another photo in front of me. 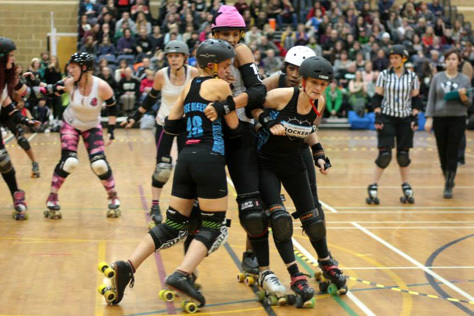 It shows Brighton’s The Mighty Mighty Bash skilfully hitting off a Central City power jammer in the 23/11 bout. “Yeah so, she does that all the time,” I tell him, “that’s Bash, she’s amazeballs.” He shakes his head and laughs in my face. Tells me that’s what they want me to think. Goes into a rant about how the whole ‘Lone Blocker Theory’ simply doesn’t hold water. He scribbles various lines on the photo and tells me at least two, maybe three, other blockers were involved – one probably holding/using an umbrella – and they were either working for the CIA or the Boston Mob. For Bash to have done it alone would involve a ‘magic block-hit’ that zipped back and forth across the track before felling the CCR jammer. I tell him I think he’s a bit nuts. He tells me that’s what they want me to think. It’s them making him nuts to make him look nuts so everyone thinks he’s nuts but that makes us nuts and him the only one who’s not nuts. “Do you really believe what they tell you about the Twin Towers?” he adds, tossing photos of CCR’s Woo-Ha and Bunny Massacre in front of me. “You think they’d collapse that easily?” I stand up to walk out but am knocked back to my seat by a churning whooshing sound, a gust of wind and the appearance of a man wearing a scarf, bow-tie, trenchcoat, fez and bad morning hair. “Hello, I’m The Doctor,” he says. There are fixed points in time and this is one of those. 23.11.13-BRRD/CCR-P2J10 it’s probably called in galactic terms. Half four on an overcast Sussex Saturday, we call it. The tenth jam of the second half shouldn’t by all expectations be a good one for Brighton. They have blockers in the box, a penalty magnet in the star and the imposing Woo-Ha lined up as opposing jammer. It doesn’t look promising on paper, but then roller derby isn’t played on paper – you can’t get the right duro wheels for such a surface – and this jam will prove to be a barely noticed turning point. Today is ‘The Day of the Doctor’ but which Doctor? Up until now it looked like Dr InKnockulator (who is actually a real doctor), but when Dr Whooligan (who isn’t) and Bash glue- and two-wall Woo-Ha to their backs, and Sham passes fast and clean to pull 92-134 in to 111-134, there is something of a sea change for the seaside league. The scores are still fairly separated, but the mood in the hall and amongst both sides has changed – the fact that Central City call a team time out is further testament to this. Brighton have 17 minutes on the clock. Brighton can do this. Bash is jamming every four rather than every two again now. Brighton were missing her in the pack, and now that they have a head of steam behind them her aggressive blocking and defensive jamming blur the boundaries between the different positions anyway. With Viv in the box, Bash pulls it back to a four-point game. Jam 13 might be unlucky for some, but not Brighton as Rose takes the missing four to tie it up at 134-134 as the crowd go, if not wild, then at least happily livid. Both teams seem enlivened by this audience reaction. The Rockers edge up a few jam points from Sham, Sophia and Bash – the latter spinning off turn one into some perfectly placed crash mats that have presumably been there all along for just this moment. The seventeenth sees the Rockers final jammer penalty (one of only three in the entire second period), and with Rose soon joined in the box by blockers Sophia and Racey Slamhard, CCR take advantage and the pendulum swings back in their favour. A strong hit on Tinchy from Bash two jams later helps Rose tie the scores back up at 152-152 with a little over five minutes to go. Oh my! Gloriously deranged London Rollergirl The Duchess of Crutches isn’t as might first appear – to co-announcer Mother Mercy, as well as everyone else in the hall – dressed as a frog for today’s announcing duties. She’s one of them Dilophosauruses out of Jurassic Park, apparently; noisy beggars they were, a fitting choice perhaps for an announcer. The majority of the crowd occupy bleacher seating to the North East (we think, we didn’t bring a compass) end of the hall, with a single row of mostly Rockers and [East]Bourne Bombshells types along the right hand wall. There are several banners – mostly home team supporting – amidst the crowd. The hall is, as one would expect, bedecked with dinosaur images and a number of folk have come in suitable fancy dress. Oh and what else… oh yes, COME ON ROCKERS!!! Brighton have just tied the game for the third time. 156-156. Crikey. All getting a bit breathless here. Just enough left on the clock for two maybe three more jams. Several of the crowd on their feet. Rose in the Sussex stars adds four, a slender lead to take into what, with 1’22” left on the period timer, may well be the final jam. The conclusion of this game is proving so exciting that even one of the Brighton players decides she wants to watch it from the bleachers. Either that or Sophia just fouled out for seven penalty box visits. Luckily she was in the pack rather than wearing the star, and Cake Or Death takes her place in the sin seats. Kapow up in the star for Brighton, Woo-Ha for Centrinnians. Kapow, the star of the bout poster, versus CCR’s captain (deputising for injured Agent Dana Scurry). The Rockers jammer, roughly a quarter of her opposite number’s height, takes lead. Passes once, then again. The period timer has run down and she could call, but this Brighton pack are rock solid. They’ve been superbly marshalled during the second half by the likes of The Hairy Fairy and Whooligan, and the latter alongside Sham and Bash are here keeping Woo-Ha pegged back, so Kapow uses the extra seconds for another pass. 175-151 to Brighton said the score prediction in today’s fan magazine. 175-156 says the official final scoreline. As the players form a victory huddle and the crowd spill down for the laps of honour, I think we’ll let them off shipping those extra five points, yeah? Not that we actually saw any of what we described in the previous paragraph. Not really. We had our hands over our eyes, peering through gaps in our fingers for the odd glimpse. Not daring to watch, pretending that we weren’t, hiding from the tension, the fear, the hope and sheer nervous energy of the most thrilling end to a bout in Brighton Rockers history. If we had a sofa here to hide behind we would have, like so many children down the years have done when a particularly scary but exhilarating ‘Doctor Who’ is on. I’m actually somewhat relieved that Bertie, Bob and Brad have a medical practicioner to look after them, but I’m not sure this guy’s actually a real doctor (the way Dr InKnockulator is) – especially not when he prescribes breaded scampi and pitchers of strawberry daiquiri all round. “So, have you found all the information you were after?” he asks. Not really, I tell him, explaining that it was a roller derby bout report I was researching, and all I seem to have gleaned is some made-up nonsense about dinosaurs, JFK and H. G. Wells. With that, he drags the others around the corner with him. There’s another sequence of churning whooshes and gusting wind. Then an eerie calm – broken only by a relieved flatulation from the old woman Bob had been sat on all this time – descends upon the Herbert George Wells pub. I glance round the corner. Nothing. Stand and walk round there. My four drinking companions have disappeared. Maybe it’s the shock of being presented with a £666.13 bill when I go up to collect my card, but I swear that I see them in the black and white photos adorning the walls as I make my way out. There’s Brad on the grassy knoll in 1963, Bob talking to Steven Spielberg on a dinosaur-themed movie set, and all the photos of H. G. Wells himself look just like Bertie. Today’s bout marked the last for Brighton’s awesome Head Ref Scoot’er, who is leaving these shores for a distant outpost of the Commonwealth. It’s a time of great change as the Rockers are also losing their beloved training venue, GYSO in Shoreham, at the end of this year – get in touch with them if you know of any suitable alternatives within easy travel of Brighton. On a more positive note, they have gained a home venue of another sort. The Cornerstone pub, a beige brick island where Elm Grove, Lewes Road and Hanover meet (and the Brighton student ghetto begins) is now the league’s official pub. They’ll be hosting after parties and socials, selling Rockers merch, and they’ve even teamed up with the Downlands Brewery to make a special beer, Off Your Rocker, for the derby team. This dark ruby ale is very nommy – indeed, the first 72-pint barrel is drunk dry within two hours of first whistle at tonight’s after party, the quickest this pub has ever gone through a nine-gallon cask of ale. There are several park rangers and dinosaurs here amongst a Brighton team whose après–skate costumes have become the stuff of legend in UK derby. The party games will get an outing later, including Rockers classics like ‘bum coin’ and a limbo dancing contest that sees the pole gradually lower from 0.5 to 0.1 Woo-Has above floor level. First, it’s time to prise the ever brilliant Central City ladies from the table football and announce the awards. For the Birmingham side there’s a lot of competition for the Best Blocker accolade, with the talismanic (tailsmaniac?) Boots Manuva seeing off the likes of impressive Rubix Crude and Scarlett McCabre to clinch the title. Viv La France picks up the equally hard to choose Best Jammer crown, with MVP going to Tinchy Slider. For Brighton, Hairy Fairy scoops Best Blocker, with the jammer award going to Chariot Sophia. MVP is probably a natural choice given the powerhouse triple threat performance Bash put in throughout the contest. We award ourselves the Longest Boutreport prize of another pint of Off Your Rocker and three shots of Jägermeister – gotta love a pub where the price for three shots is less than the price for two – before heading off back out into what passes for normality in this part of a blue-green chunk of rock spinning inexorably around a giant ball of burning gases. A week after meeting Brighton, Central City were in action again, this time taking a comprehensive 241-81 win against the only other UK derby league we know of with its own beer, Sheffield Steel Rollergirls. 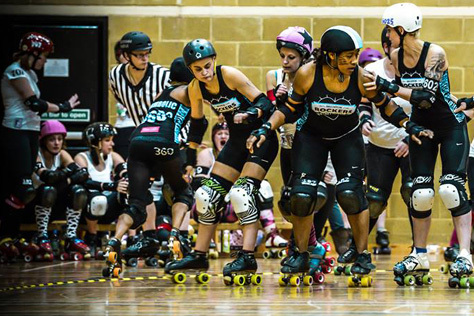 The Brighton Rockers, meanwhile, will be back on track in 2014, and are still looking for people to join their January ‘Fresh Meat’ trainee intake – contact info@brightonrockers.com for details. This entry was tagged Brighton Rockers, Central City Rollergirls, roller derby, roller skating, sport, UKRDA, women's sport.